Doll repainter Noel Cruz's work is so realistic it's like, "Honey, I shrunk Beyoncé!" 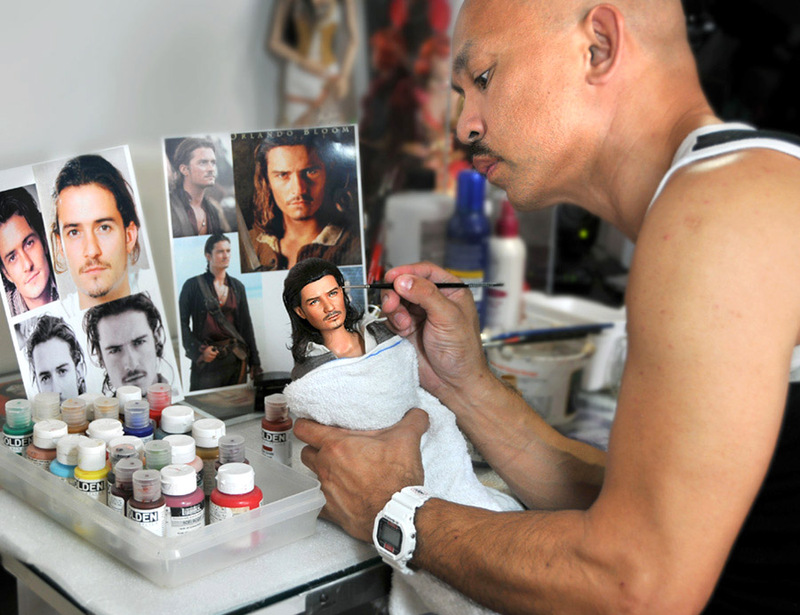 This is Noel Cruz with the cast of Pirates of the Caribbean. Oh hay Keira! How's it going? Oh wait never mind they're actually just dolls. But it's like, "How did you get so small, Johnny Depp?" Noel is a Filipino-American artist based in Anaheim. He repaints dolls to make them look like the real thing. And they're as realistic as plastic can get. He got his start when his wife started collecting celebrity dolls and he saw them as a new canvas for his art. He repaints a new doll face by washing the original layer of paint and applying his own with more intricate detail work and shading. That eyebrow raise on Vivien Leigh fromg Gone With The Wind is spot on. His hard work is well-praised in the doll community and for good reason. He takes the mass-produced dolls by companies like Mattel and turns them into one-of-a-kind pieces. These veins Noel applied to this Voldemort action figure from the Harry Potter series are gross and wonderful. This gorgeous Princess Diana was sold through Noel's eBay store for $1600. And Noel has sold dolls for upwards of $3000. The work this Cher had done made her go from $70 to a whopping $3800. When painting, he works delicately, often forgoing brushstrokes and going for little dots of paint instead. When doing meticulous detail work, Noel says he visualizes himself as the same size as the doll. It shows in this one of Elizabeth Taylor. Just LOOK at that mole placement! He even cuts the doll hair in layers and applies mousse to perfect the new do's. It shows in Anne Hathaway's bangs and Meryl Streep's white mane on these Devil Wears Prada dolls. Each doll could take 48 hours of work in total. These two-day makeovers result in perfect replications of icons like Audrey Hepburn in Breakfast at Tiffany's. Noel says there's it's sad when he sells the dolls off, but he's happy there are people out there who appreciate his art. I'm sure Lady Gaga would love to have this Telephone doll of herself. It's Artpop, am i rite?! And when the work is this perfect, who wouldn't appreciate it? Noel even got the changing skin tone just right for Michael Jackson circa Bad. If you want to see more, check out Noel's website. So, do we love or do we LOVE?